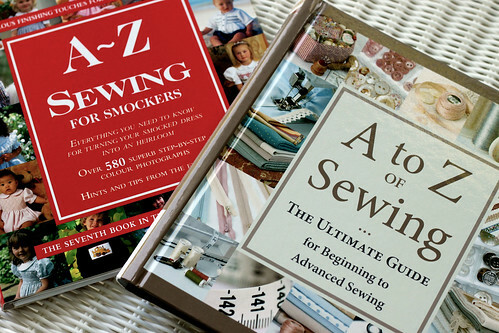 I love all the A-Z needlework books. These sewing books contain how to information that I have not seen in other sewing books. Things like how to make mini-piping to how to use a smocking pleater. Most of the techniques are for heirloom sewing, so tailoring or sewing polar fleece are not included. It is the little things in these books I really like. There are instructions on how to sew on a button with embroidered roses. Some of the techniques I remember doing in my costuming days. It is nice to have them now in book form as a reminder. I don’t put many continuous plackets into a seamed skirt back anymore. It is great that I can look it up rather than having to spend time trying to jar my memory if by some chance I need to close a skirt that way. This entry was posted on Thursday, July 23rd, 2009 at 3:00 am and is filed under Sewing. Tagged: Book, Sewing. You can feed this entry. You can leave a response, or trackback from your own site. Thank you for the posts re: Sewing books. I never really had a basic background in sewing, i.e. garment construction, etc. It was always so evident when a customer would come into my quilt shop with a previous knowledge of general sewing. She would take to quilting like that proverbial duck to water! Having that foundation is invaluable & these books would certainly be a good investment to our sewing libraries. BTW – we are still comfy up here temperature wise but desperately need the rain.